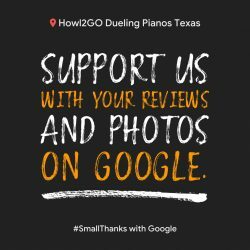 Our Dueling Pianos are rated #1 in Texas. Check out reviews then contact us to book your own Howl2GO by Howl at the Moon event! Howl2GO was very easy to work with prior to my event. They were responsive and communicative. They made the booking process seamless and fast. They were entertaining and our guests enjoyed their performance. I would recommend booking them for your next event. The event was simply amazing! The crew from San Antonio did a fabulous job and we have had the most positive feedback from everyone in attendance. We cannot thank you all enough for helping us throw a fantastic party and a successful fundraiser! Howl2Go did an amazing job at the fundraising event for our local Ronald McDonald House Charities. The great thing about having Howl2Go play at your party or event is that they can entertain any audience. Country, Classic Rock, Hip Hop…..you name it they can play it.